The Girlcott is indebted to the following organizations for their enthusiastic support. This event would not have been conceived without their trusted resources, valuable insights and dedicated commitment to address our society’s growing environmental health challenges. Please visit their Web sites to broaden your awareness of the many initiatives they have undertaken on our collective behalf. We urge you to support their endeavors with your personal or financial commitment and we hope you will have the opportunity to meet many of their inspiring staff members at The Girlcott. The Environmental Working Group was founded in 1993 with a goal to protect the most "vulnerable segments of the human population from health problems attributed to a wide array of toxic contaminants." By employing the "power of information," EWG has educated and inspired thousands of consumers to learn how to better protect their families and communities from environmental health hazards. Their Skin Deep is a must-know for all supporters of The Girlcott. With their inspiring slogan declaring that "the next generation has the power to bring about change," the Teens Turning Green have established themselves as worthy leaders of today’s green movement. This national coalition of nonprofit health and environmental organizations is working to "protect the health of consumers and workers by requiring the personal care products industry to phase out the use of chemicals linked to cancer, birth defects and other serious health concerns and replace them with safer alternatives." As you can imagine, this organization was a major inspiration for creating The Girlcott. Responsible disposition of potentially hazardous waste is critical for the health and sustainability of our natural resources. The practices and procedures innovated by SF Environment and partners such as SF Recycling and Disposal have become the gold standard in the waste management industry. moregreenmoms was launched with a purpose to educate consumers about how the simple choices we make each and every day may impact our human health and the sustainability of our planet. After sensing demand for a positive, proactive effort to further raise awareness around the chemical chaos associated with the cosmetics and personal care industry, moregreenmoms founder, Christine Gardner, architected The Girlcott with a bold hope that it will be replicated to support Awareness, Action, Alternatives and Advocacy in communities across America. Change Starts at Home has launched an inspirational, practical and action-oriented platform for women from across the country to share ideas about how to make positive economic, environmental and social change. Contributors to the site are as diverse in perspective as they are in background, but they share a genuine commitment to make the world a better place. Founder Laura Rose is passionate about the opportunity to affect essential, positive change in our households, our communities and our country by reaching out to women to provide them with the information and the impetus to make a difference. 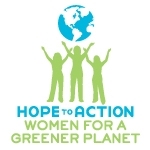 Hope to Action is the movement of women for a greener planet. Together we are taking action to address climate change and protect our environment.